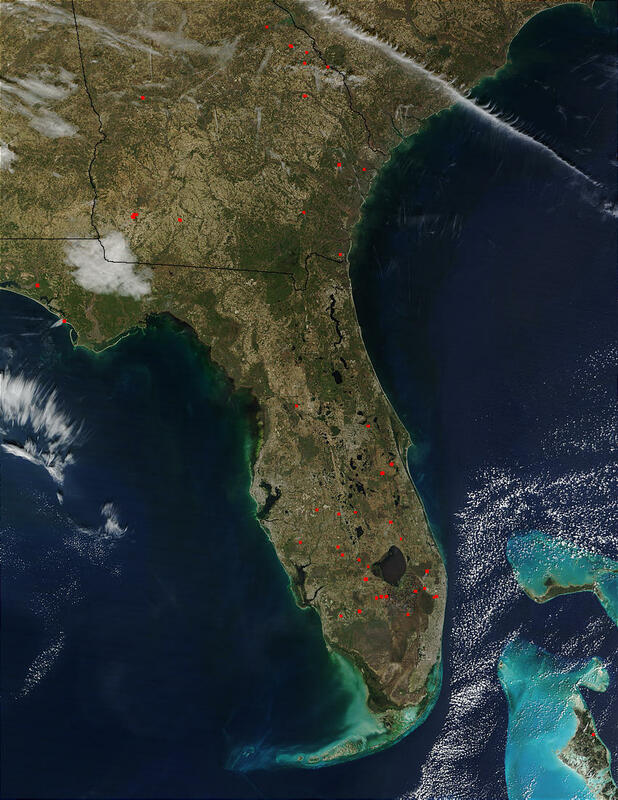 In Florida (south) and Georgia (north) scattered fires (red dots) were detected by the Moderate Resolution Imaging Spectroradiometer (MODIS) on the Terra satellite on Feb. 13, 2003. South of Florida’s Lake Okeechobee, the Everglades stretches out toward the coast, and the Florida Keys taper off from the state’s southern tip. At the southeastern tip, a strip of cement-colored terrain marks the location of West Palm Beach, Fort Lauderdale, and Miami. The dense, dark-green vegetation stretching out across the border of Georgia and Florida is the Okefenokee Swamp. In the high-resolution imagery, airplane contrails are visible in the Atlantic off the coast of Georgia.